Please note, price does NOT include admission. Each guest will need to purchase a ticket. This package includes unlimited beer & wine for the duration of the cruise. This package includes unlimited beer, wine, and premium cocktails for the duration of the cruise. Please note, price does NOT include admission. Each guest will need to purchase an admission ticket. Please note, price does NOT include admission. Each guest will need to purchase a seated ticket type in order to receive the Vanilla Celebration Cake. Each guest will need to purchase a seated ticket type in order to receive the Chocolate Celebration Cake. Each guest will need to purchase a seated ticket type in order to receive the bottle of Lunetta. Each guest will need to purchase a seated ticket type in order to receive the bottle of Moet Imperial. Each guest will need to purchase a seated ticket type in order to receive the bottle. Your choices are Absolute, Jose Cuervo, or Jack Daniels. There’s a Friday night happy hour NYC cruise with your name on it, and it’s right here! Get ready for a weekend party cruise in The Big Apple like no other. Hop aboard The Hornblower Yacht for a night of fun, drinks, dancing, and excellent views of this world-famous city from a yacht. Friday was made for partying, so why not go all out with an epic yacht party to bring in the weekend? It’s been a long week, and you deserve to let loose and enjoy the weekend. 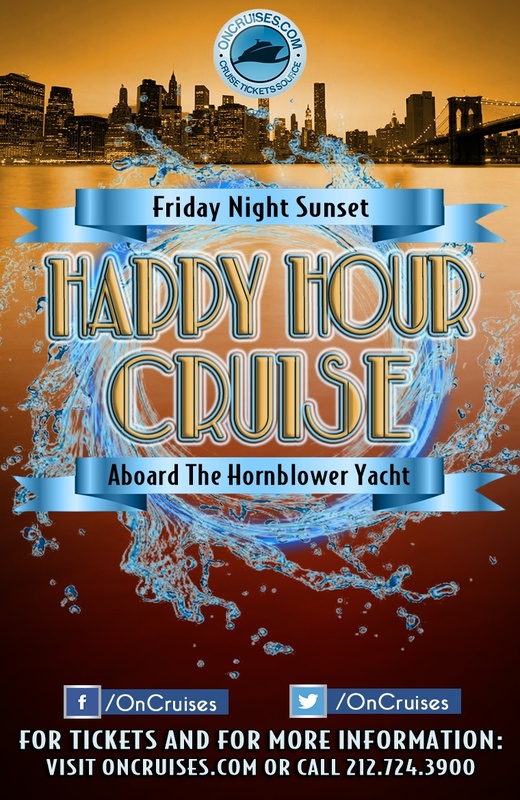 We can’t think of a better way to do just that than aboard this Friday night happy hour NYC yacht party. The Hornblower Yacht has not one, but two spacious, climate-controlled interior decks. You’ll be absolutely comfortable while you move and groove to musical stylings of our live DJ. Whom will be playing a mix of the latest and greatest in Pop, Dance, Electronic, Hip Hop, and Top Billboard Hits. You’ll also be getting a premier tour of the city. Make your way to the vessel’s skydeck, where you can grab some fresh air and take in the astonishing views of NYC. Get up close and personal with The Statue of Liberty, Freedom Towers, and the city’s many famous bridges. We’ll give you plenty of perfect photo-opts at this Friday night happy hour NYC party. So, now you know what this Friday yacht party has to offer. The only thing left is to tell your friends, co-workers, or whoever, and get those plans in order. We know how much you love being on that phone. So why not follow us Instagram, Facebook, and Twitter? Keep up to date with all the events we’ve got going on, and you may even find a sweet discount code here and there on our feed. And after you come to one of our events, don’t forget to tag us in all those pics and vids!